01.27.19 Eight-time Maine State Chess Champion Jarod Bryan added another title to his impressive resume. Bryan won the 2019 Maine State Blitz Championship played on Saturday, January 26th at Hermon High School in Hermon Maine. Players found there way through a mind-numbing crucible of sixteen games at the blitz time control of G/3+2. Tournament Organizer and Director Wyatt Hendrix tendered this report of the event for ChessMaine.net. The event featured many fantastic games and exciting time scrambles. I am very happy that the event was a success. The event raised a good amount of money for our school team and provided some local kids with experience against stronger players. The venue seemed to be quite nice. Boards 1 and 2 were in their own room (board 1 had some nice swivel chairs). Board 1 also played on a DGT board. Although there were some technical errors and we couldn't record the games like we wanted to, it was still a comfortable set to play on. I of course congratulate FM Jarod Bryan on his victory, becoming the first ever Maine State Blitz Champion! His participation is what really made it a legitimate state championship event. This was my first experience directing and I really jumped in head first. My first event as a TD was a 30-player state championship event! I am very thankful to all who came to play and support our event. The event will be back next year (date TBD), likely in the same venue. I do have plans for organizing (along with Bill Hartt) a Maine Rapid Championship either in the fall or late summer, possibly at Hermon High, but not necessarily. This event fulfills part of the goals that Bill and I laid out when we decided to dabble in directing: to create a better variety of time controls at Maine chess events. Although G/60 d5 and G/45 d5 are good time controls, we still want to have some different types of events. This is why we are so interested in rapid and blitz events at the moment, but we are interested in having some G/60 events as well. This of course also means organizing events with slower time controls (G/90 +15, exc.). I know I personally have sent a proposal to MECA for the creation of a Maine State Correspondence Chess Championship, which I will probably take part in organizing. 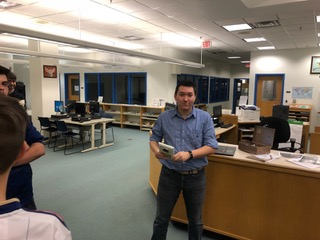 Tournament winner Jarod Bryan makes Maine Chess History by receiving the first Maine State Blitz Championship trophy and holding it for the crowd to see. 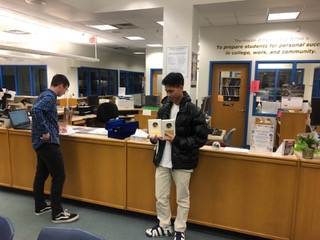 Previously unrated Bach Nguyen holds two plaques, one for runner-up and one for Scholastic (K-12) Blitz Champion. This wonder kid has burst onto the scene and may have already established himself as one of the top scholastic players in Maine (He drew his match 1-1 against State K-12 #1 Wyatt Hendrix, and beat state K-12 #2 Bill Hartt 2-0). Stephen Wong showed it's good to play chess the Wong way by taking home the State U1600 Blitz Champion title. 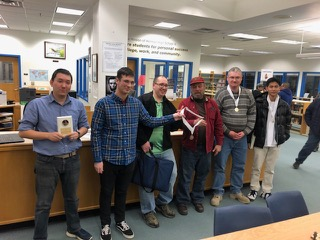 The winners pose for the camera (from left to right): Stephen Wong (top U1600), Wyatt Hendrix (TD and 3rd place tie), Nathan Gates (3rd place tie), Barry Magda (3rd place tie), Jarod Bryan (1st place), and Bach Nguyen (2nd place and top Scholastic). Congrats on a great event! I hope the rapid championship does take place, hopefully in the summer so players back from college and graduating scholastic players have an opportunity to play! Also, what school is Bach from? His rise is awesome for Maine scholastic chess! congratulations Jared and to all others for participating and a special thanks to the organizers.